Archery is a predominately skill-based activity. However, it is also a sport that requires you to use your muscles. The action of drawing and holding a bow are specialized skills using muscles that are not often trained in quite the way archery utilizes them. 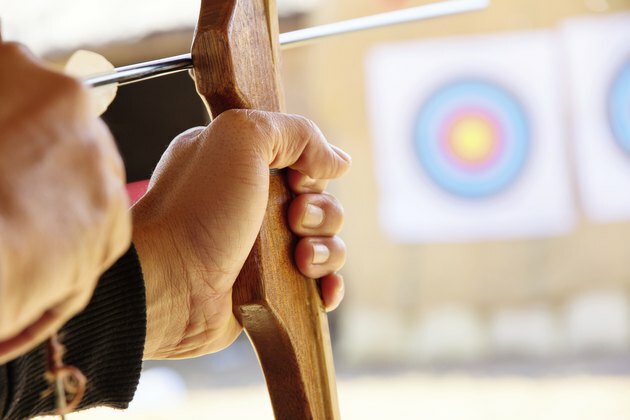 In addition to strengthening your specific archery muscles, it is also important to train the antagonist muscles to reduce the chance for injury. Stability is the most important factor when training your bow hand. Your ability to hold your arm and the bow in a static position is fundamental to your aim. The muscles that stabilize the bone of your upper arm, the humerus, in your shoulder socket or the glenohumeral joint, include the supraspinatus, the infraspinatus and the subscapularis. These muscles may be familiar to you as the rotator cuff complex. These work along with the anterior deltoids, traps lats and rhomboids. Your bow hand's wrist stability and grip strength should also be trained. All of the muscles of the forearm work together when gripping and stabilizing an object such as a bow. These muscles are arranged in multiple layers: superficial, medial and deep layers. The muscles of the anterior forearm flex the fingers and wrist while the muscles of the posterior forearm extend the wrist and fingers. Your drawing hand uses the same gripping muscles as your bow hand, but here the action of drawing your bow emphasizes finger flexion, or the muscles of your anterior forearm. Drawing your bow also involves the muscles that flex the elbow. These are your biceps and the brachialis (ExRX). Not only does your bow arm need to be strong enough to draw back your bowstring, it must also be strong enough isometrically to hold your bow at full draw. Archery involves your entire body. Your arms and upper back draw the bow and hold it, but you need the rest of your body to provide support. In a proper shooting stance, you are standing upright with your feet parallel in a square stance or slightly staggered in an open stance. A long shooting session requires endurance in the muscles responsible for extension at your hips and knees. These include the gluteus maximus, semitendinosus, semimembranosus and biceps femoris for hip extension, while the quadriceps are responsible for knee extension. It is important to train the muscles responsible for the majority of the movements a sport requires. However, it is also important to train the antagonistic muscles for each movement. For example, drawing the bow involves the biceps. To prevent overuse injuries, you should also train the triceps.